I've had my Apple Watch for a week now, and I'm ready to talk about my delivery time, how I feel about it, and how I use it. It's been mostly great, but there are a few things I hope Apple fixes. Note: this is not a formal review. 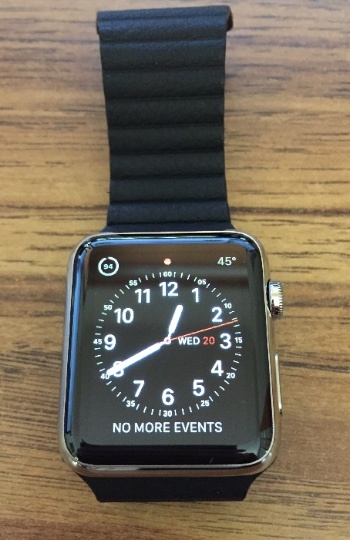 For that, see Jeff Gamet's "Apple Watch In-Depth Review." I wasn't awfully impressed with the packaging when I first opened it. The white plastic tries to look cool, but it just seemed to me like a giant power adapter brick. Or perhaps the old Apple DVI to ADC Display Adapter. Apple could have done better here, especially with the steel/sapphire models. Under Promise, Over Deliver. Almost. Like many others and most in our TMO team, I was up just before midnight Pacific time on April 9th to place my order. After some initial connection problems and placing my order at midnight + 3 minutes, the email I got at 1:04 am Denver time on the 10th said the estimated delivery would be May 13 to May 27. My watch arrived on May 14. And so, while my wait was agonizing, and I lamented that Apple could not ship this new product right after I ordered it, I did agree to the delivery date at the time of purchase. And Apple delivered on the second day of the window it provided. Given the (rumored) production problems, I'll chalk this up to (almost) under promise and over delivery. Setting up the Apple Watch (42 mm stainless/sapphire, leather loop) was a breeze with the iPhone 6. It was obvious what to do at every step, and the amazing 3D animated pattern used to pair the devices was straight out of a SciFi movie. I had the Apple Watch up and running in about 20 minutes with no difficulties. As I started experimenting with the settings on the iPhone with the Apple Watch app and then testing the watch, I didn't run into any gotchas or bugs that one might expect from a 1.0 release. There may be bugs, but I wasn't bitten by any. Another thing I noticed was the burnt orange/fire theme, and realized that I'd see this theme before on the Amazon Fire Phone that I reviewed last year. That color on black is indeed beautiful. I was amused by all the reports, I should say guesses, about the presumed battery life of the Apple Watch before it even shipped. My own belief was that Apple was warning us to be careful, yet prepared to over deliver. I think Apple did just that. Here's the remaining battery percentage I recorded each night before I put it on the charger. The average was 64 percent. That means, for my own use, I might be able to charge every other day. Not bad. I did the Watch OS 1.0.1 upgrade on May 19, and it took much longer than I think it should have. I know the Apple Watch doesn't have a lot of processing power, but 25 minutes to do a minor upgrade was greatly annoying. Plus, the charger sits by my night stand upstairs and the iPhone, when next to it, is rooms away from the AirPort base station downstairs. At first, I thought I was going to have to carry the iPhone, Apple Watch and its inductive charger downstairs to my office. But the Wi-Fi connection was okay. This was a passable but not great user experience. 1. Beautiful time keeping on the go with the Utility face, current outdoor temperature and my next calendar event. 3. Monitoring my movements (steps) while I'm at work, even as the iPhone remains stationary on my desk. The Apple Watch reports to the iPhone, and I monitor with the fabulous Fitport app. 4. Being able to receive and send text messages and phone calls when my iPhone is in another room. This is spectacular. 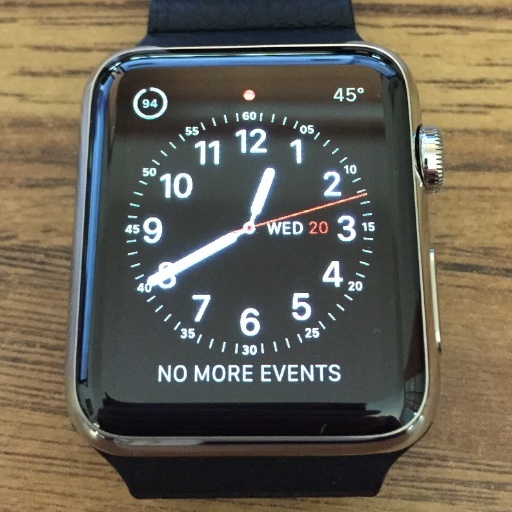 I'd like a demo mode that keeps the Apple Watch display on for a few minutes. It's really hard to demo the watch to friends with the unchangeable display timeout of about 20 seconds. It could also help the salespeople in the Apple retail stores. I'd like a mode that shows six or so of my favorite apps with larger, easier to touch icons. I'd like to be able to assign those six to a rectangular grid for easy positional recognition and tapping. A faster OS upgrade of course. Programmable haptics for different notifications. A more complete set of data items that can be added to every Watch face. Right now, not every item is available for each face. I am incredibly pleased with this device. Not only is it a beautiful timepiece, but I don't mind admitting that the Apple Watch makes me feel more technical, better informed, more connected and pleasantly geekier. But it doesn't intrude on my life because my initial instincts were to shut everything down at first and slowly open it up to me as the need dictated. See, for example, "Ruthless Gatekeeping is the Key to Apple Watch Bliss," by our Dave Hamilton. Unfortunately Apple gets too enthusiastic about all the features of the Apple Watch and doesn't want the user to miss a single thing. That can result in overload, as Dave described. Making sure you only use what you need, gradually, helps manage the device better, prolongs the battery, and allows for a more gradual and deeper learning experience. All in all, how could I have gotten along without an Apple Watch before? Inconceivable. Now that I have it, I can't imagine going back to the nice but low-tech Swiss Army watch of yore.